We left off last week with Capt. Keith of the Wizard having his 18 million ton boat come crashing down on his head whilst trying to fix the damn thing. Honestly, isn’t this something you pay someone else to do? It’s called delegating. Learn it, use it, love it. Anyway, he has a concussion and a good gash in his head now, but it looks like he’ll make it. Whew… dodged a bullet there. Also, if he did end up dying, who is gonna sail the ship back to Dutch Harbor. I guess that’s reason number 453 not to let your captain free-dive in the Bering sea. The next 30 minutes of the show were devoted to fishing. Good times for the Time Bandit and their merry bunch of white-trash pirates, bad times for everyone else. I gotta say, a couple of seasons ago I thought the Time Bandit crew was just retarded, but after a while they do grow on you. Still, I never trust a man who spells his own name wrong, and I’m pretty sure that “Johnathan” is not your traditional interpretation. The one guy I feel sorry for in this whole mess is the substitute skipper of the Cornelia Marie. Murray is in a tough spot. Mike Rowe said it best, “No crab and no plan.” They even had Capt. Phil perform a horribly staged pep-talk call from back at the harbor, which Murray half listened to, before continuing on his futile attempt to find the crab. Seriously, I give it 3 episodes max before we see mutiny on the Marie. One of the cool things about the show is that they have a cameraman ride along with the Coast Guard on rescues. Of course, the downside to that is the fact that sometimes people don’t make it out alive. In this case, the coastguard had to fly 9 hours through the night, only to arrive on site to see a bunch of rope and a life ring. They did end up finding a survival suit, only to see the occupant not survive. It’s tragic that these things happen, but it just makes you more aware of how dangerous a job fishing really is. The one thing I would like to say about the season thus far is this: did the producers just find out what a cliffhanger is? I almost think they are taking a cue from Hell’s Kitchen with the way the cliffhangers turn out to be something completely different than you were expecting. First it looks like Keith is gonna bleed out in the water, now they’re trying to make you think that somehow the other 10 crew members of the sunken boat might have survived the night. Let’s face facts here, nobody made it. It’s cruel to insinuate anything other than that. That said, I’m still gonna hold my breath and hope for the best on next weeks show. If reading all that didn’t put you to sleep, I’ve also got a little food review for ya. Dont’ worry, I’ll keep it short and sweet. Thanks to Morgan at CorneliaMarie.com I was a man on a mission this week. 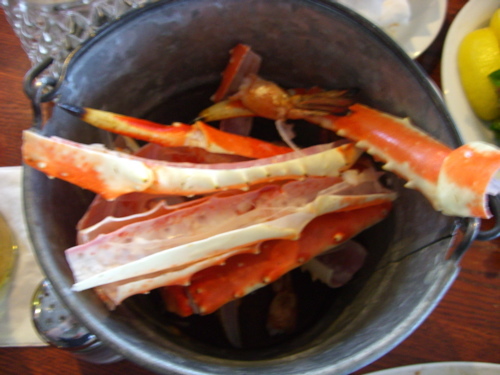 That mission: to find and consume the elusive Alaskan King Crab. And that, my friends, is exactly what I did. Rest assured, that I will be eating this beast once or twice more over the course of the season. 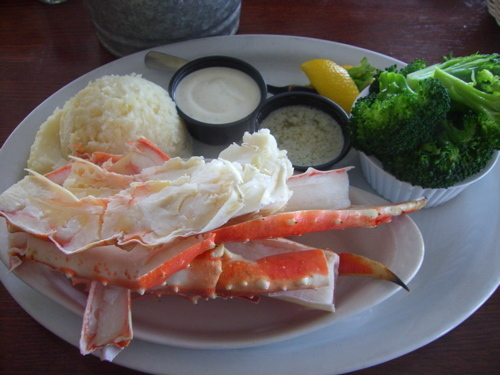 If you have suggestions on where to get the best king crab, share ’em in the comments. Spinnaker Seafood Broiler is a little place that Mikey found online. It is at the Harbor, but not up front with Brophy Brothers and Andria’s. It’s hidden in back next to Harbor Sushi. What it lacks in looks, it more than makes up for in food. We started off with a beer. Mikey had a stella because he is an elitist, beer drinking Euro like that, while I had a kona lager. The waitress brought out bread that was still hot, not warm, hot. It was soft and fresh and all kinds of good. Because Mikey and I like to eat, we ordered the Crab Stuffed Mushrooms. 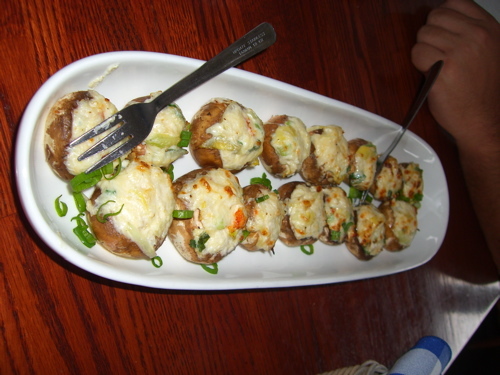 Believe it or not, these are mushrooms that are stuffed with crab. They also have some cream cheese, parmesan, green onion and a little mayo, which thankfully I could not taste. They were a nice little warm up item, although I was hoping that they would have a little more crab. When the main courses came out, I was instantly pleased with my decision. My crab was huge. It’s the kind that the deckhands have to bootstomp just to get it into the tank. I got the garlic mashed potatoes and steamed broccoli as sides and they were awesome. The mashed potatoes were light and the broccoli was steamed perfectly, not too mushy and not at all raw. The star of the show was the crab though. It was really juicy and they did the work of cracking the shells so it was easy to get at it. A couple times I even got all the meat to come off the tendon in one superchunk. When that happens you have an obligation to cram the whole piece into the butter, then hold it way up in the air and show the entire restaurant before hungrily dropping the whole thing right into your open mouth. If you need a visual, think about how you feed a dolphin at Sea World. Mikey let me try some of his Fisherman’s Platter in exchange for 1/2 a crab leg. (What can I say, I drive a hard bargain.) I tried the shrimp, scallop and halibut and thought they were pretty damn good. The scallop was very tasty and not squishy at all. 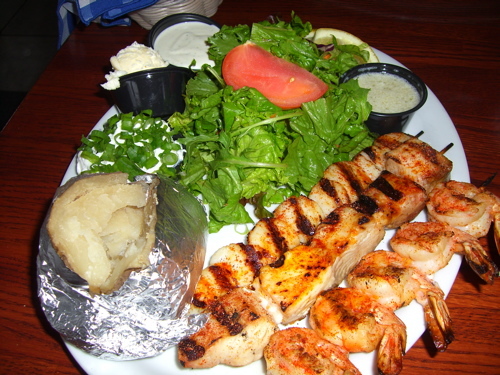 The halibut flaked off nicely and really grabbed the smoky taste from the grill and the shrimp, which was my least favorite, was still decent. It was just a little on the dry side for my taste. The only thing I know Mikey was not happy with was the huge garnish that they called a salad. He said that he couldn’t move his fork without throwing lettuce on something. To summarize, this place rocks. It was a totally unexpected find and I think in terms of value it ranks up near the top of my list. If you like great seafood, but enjoy a more casual atmosphere, this place might just be perfect for you. I mean, Mikey wore his tuxedo t-shirt, but you could probably get away with something a little less pretentious. Alright, that’s all I got. Happy Earth day! Hope you enjoyed the longest post in the history of EatMeCalifornia.com. Is that the one that has an outdoor seating area and is next to the ice cream shop? I was pretty sold on it from your description, but once you mentioned that the cracked the shells for you, I made plans to go this weekend. I love crab but I almost never order it because it’s too much work. It’s next to the icecream shop, but I didn’t see any outdoor seating. Maybe i’m blind though. Let me know what you think after you try it. I really had a good meal.